How do I register or activate Filmora for Mac? Method 1 Create Wondershare ID account with the email address which you used to purchase this software. Please refer to below screenshot. Method 2 Type the register code directly without signing with Wondershare ID account. Here is the screenshot you can refer. How can I activate Filmora9 for Mac? 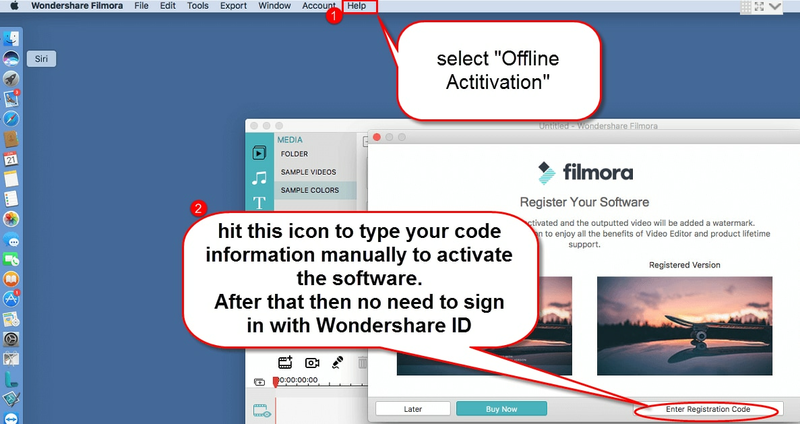 You can use the same Wondershare ID account to activate Filmora9 through online or offline activation. Will Filmora8 or older versions be replaced after I install Filmora9? Actually, Filmora8 and older versions are totally different from Filmora9. Filmora9 will not replace your older versions, so they can be installed at the same time and saved on your computer. Is there dark skin for Mac version? There is dark skin for Filmora9 and above on Mac, but there is no dark skin if your version is older than Filmora9. How can I remove the watermark added on the video created in trial version? The trial version and registered version of Filmora for Mac is functionally the same product. The limitation is that there will be a watermark on the exported videos. You need the registered version to output files without watermark. So to remove the watermark, you need to ensure that you have managed to register the program. Secondly please select Open Project/Open Recent from the top menu to reload the project file (.WSVE file). Lastly press Export button to export the project file again, there will be no watermark added any more. Note: After you purchase and register the product, the output video with watermark cannot be removed, and you need to output the file by using the registered version again to get the output files without watermark.